This is the IPC house ad, published in weeklies dated 6 October 1984, promoting the BARON IRONBLOOD cardboard mask giveaway in the following week's copies of EAGLE AND SCREAM!, TIGER and (of course) BATTLE ACTION FORCE. I'm sure the giveaway was bankrolled by Palitoy as a way of drumming-up a bit of extra business for the toys in the crucial pre-Christmas sales period. 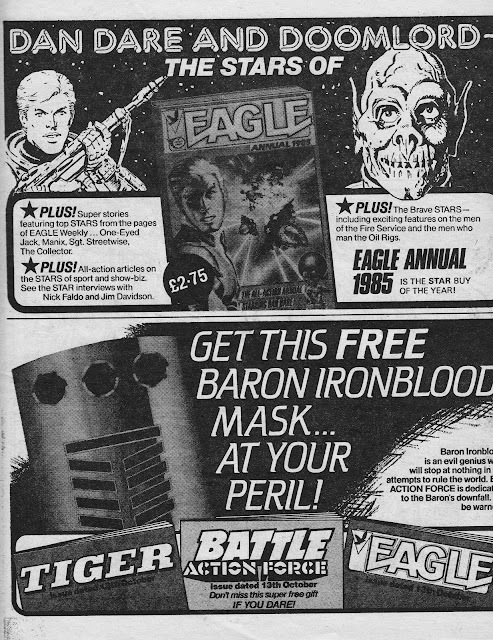 The mask, which (sadly) I no longer have (despite having at least two at the time: I was a regular reader of both Eagle and BAF), was a flimsy cardboard affair which, when elastic was added, made you look (a bit) like Action Force's bucket-headed villain. Why anyone at Palitoy thought the Ned Kelly look was a good one is beyond me (although the mighty Hasbro made a similar blunder with G.I. JOE: Cobra Commander first appeared with a tea towel as a disguise). The top of the page is a plug for the third of the (new) EAGLE ANNUALS. Click here for a full rundown. It's weird to think that, by 1984, it had already become a Birthday/ Christmas tradition.